According to a recent article in the Navy Times, the military branch is experimenting with healthier food offerings at a couple of units for the remainder of the year. The plans involve swapping fried food and French fries for baked versions, replacing whole milk with skim and soy alternatives, and generally including more vegetables. Navy Secretary Ray Mabus announced that the changes would be coming in May, adding that a well-balanced diet is “the foundation of a healthy lifestyle.” If all goes according to plan, the new rules would be implemented across the whole Navy in 2017. Some have welcomed the change, but many have been critical of the decision, the website Vocativ discovered. A post on the Navy Times’ Facebook page featured dozens of comments, many of which were from former and current Navy members blaming Michelle Obama for the change. 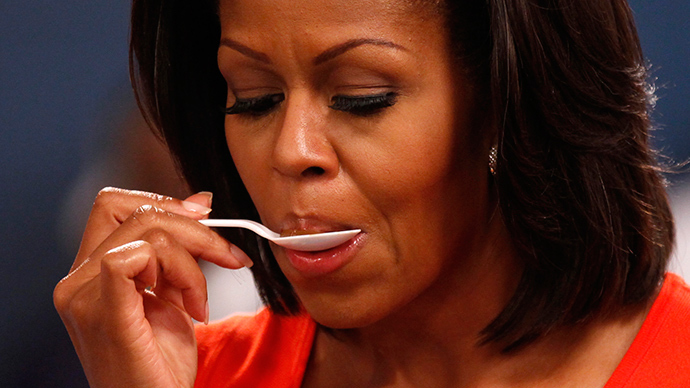 “Sounds like MICHELLE OBAMA strikes again,” wrote Matt Klinghammer. “I see that Michelle Obama’s school lunch program has made its way over to the Navy...” added David Eickelmann. “How did Michelle Obama get into our galleys? That’s what workouts are for,” wrote Vic Tegio. Others pointed out that the military had stopped installing deep fryers on new ships before President Barack Obama even took office, but that didn’t quell the angry seamen. “I’m glad I got out when I did! I guess you guys want a mutiny! Is Michelle Obama running the food program? !” wrote Ed Anderson. While some sailors were upset with the news, promoting a healthy diet has become a priority for the military. A newly released report found that about 33 percent of young adults are too fat to join the armed forces. Mission: Readiness, a nonprofit and nonpartisan group of former military leaders dedicated to improving the state of today’s youth, issued the study which stated that obesity is the number one reason young people between the ages of 17 and 24 cannot enlist in the military. As a result, the group is pushing for schools to offer healthier lunches to children. “We think a more healthy lifestyle over the long term will have significant impacts on both the military posture – those available to get into the military – and across our society as a whole from a medical perspective,” retired Brigadier General John Schmader said in a phone interview with CBS News. Meanwhile, a 2013 report from the Associated Press found that many in the military had started using liposuction to pass the Pentagon’s body fat test. The test measures an individual’s neck to waist ratio in order to determine body fat percentages, but critics say it can exclude those with larger body builds who are otherwise healthy. “They come in panicked about being kicked out or getting a demerit that will hurt their chances at a promotion,” Adam Tattelbaum, a Rockville, Maryland surgeon, told the AP.